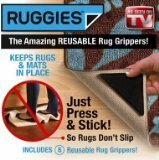 These keep area rugs and mats in place and help prevent slippery accidents! Just place them in the corner of the carpet or rug. Press in to secure the pad in place. Full detail instructions are inside. It leaves no sticky residues on your carpet or floor! You could reuse them by simply washing with soap and water. They are also suitable for many types of flooring. Included inside: 8 Rug Grip Pro pads, 8 strips of removable tape, and full instructions. Nalahome Modern Flannel Microfiber Non-Slip Machine Washable Round Area Rug-ter Art Backdrop with Circuit Board Diagram Hardware Wire Illustration Emerald Fern Green area rugs Home Decor-Round 32"